Disease-free survival and quality of life of the oral cancer patient can be influenced by nutritional status. Malnourished patients are at high risk for surgical and treatment-related complications ultimately impacting survival and many aspects of quality of life. Validated malnutrition screening can identify oral cancer patients who are at risk for malnutrition and promote proactive intervention for prevention by triggering a full nutritional assessment by a qualified nutrition profession, such as a Registered Dietitian. Prevention and rehabilitation strategies should be individually planned and initiated within a team setting that includes not only nutrition, but also speech and swallowing therapy, physical and occupational therapy, and psychosocial therapy. The Patient Generated-Subjective Global Assessment (PG-SGA) is a robust tool for both screening and assessing cancer patients. Individualized intensive dietary counseling and nutrition support are warranted. 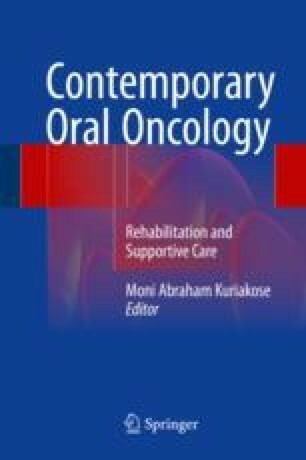 Predictive factors indicating need for nutrition support among oral cancer patients include, but are not limited to, tumor location, tumor stage, multi-modal therapy, body mass index <20, and pretreatment diet consistency. Predictive models for nutrition support and feeding algorithms based on patient data need to be validated and incorporated into comprehensive nutrition care pathways.